Don't know much about this candleholder. The example on the left, with the metal top to replace an apparently damaged original, sold at the 2009 Southern California club convention auction for $675. It is marigold, 10 inches tall. On the right is a complete example, albeit with weaker iridescence, that is owned by the same collector. It should be pointed out that there are similar candleholders that were originally made of clear glass but have had a weak and spotty iridescence applied that easily scratches off. 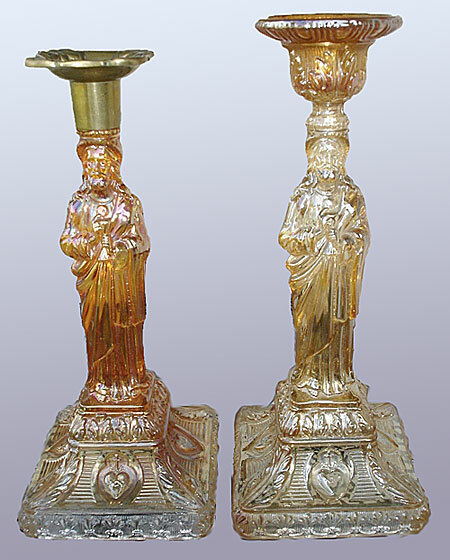 While the design of the fake candleholders is similar to these, the easiest way to tell the difference (aside for the poor iridescence) is that the base has four toes that spread out from a circular base.